In January 2014 we displayed photographs of mock-ups of the interiors and certain external features when on display at Excel Docklands. The publicity launch and subsequent inaugural run on 24th May 2016 presented the opportunity to record details of the real thing. This is the first of three pages of interior details of unit 700109, for exterior details please click here. We commence our tour with first class accommodation. 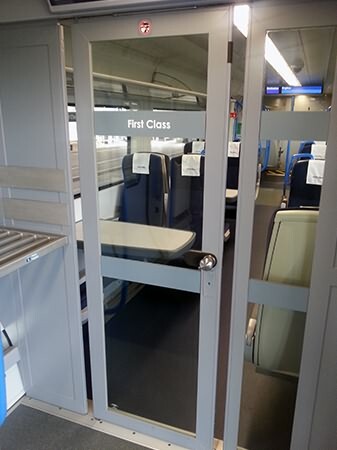 This is the vestibule leading to the first class saloon in one of the two driving motor composite open vehicles. A first class saloon, which like standard class has seating in a 2+2 configuration. 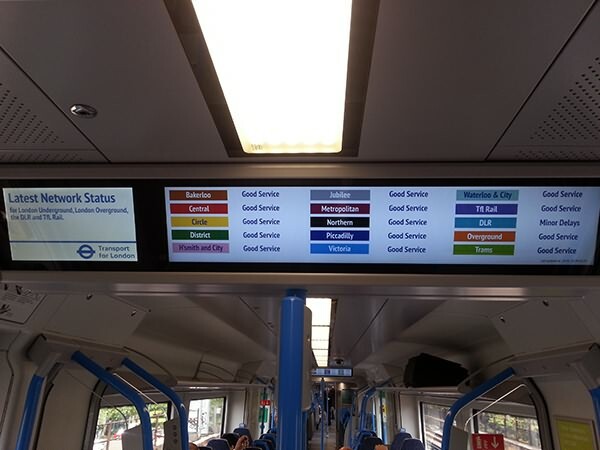 The passenger information screen (PIS) can display real-time travel information, including, as seen here, for Transport for London services. 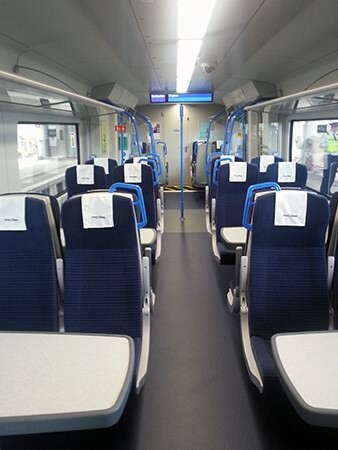 (above) Demonstrating the full width inter-car connections, the view from one standard class vehicle to the next, showing the predominantly coach (face-to-back) type seating. Also that the seats are cantilevered from the car sides to provide under-seat storage. 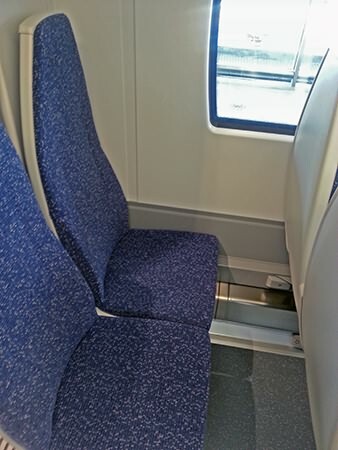 (below) One of the limited number of face-to-face seating bays in standard class. Note the lack of tables and 240v AC or 5v DC USB power outlets. 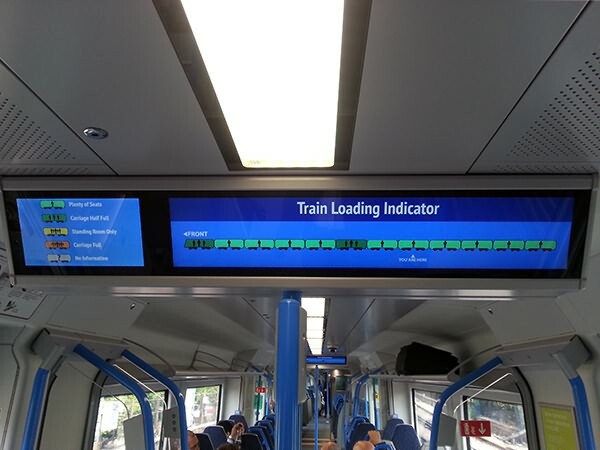 Nor do class 700 units have wi-fi. 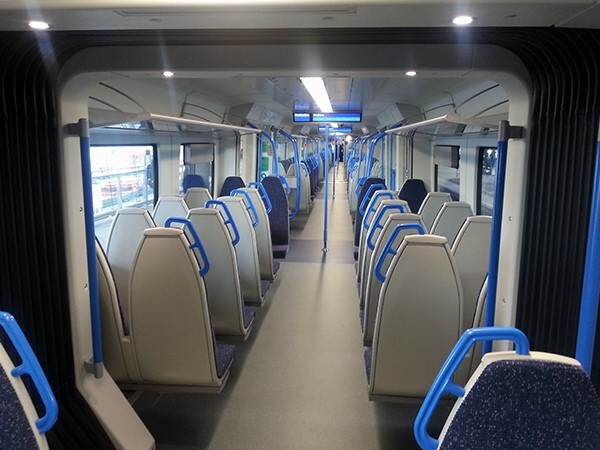 (above) Despite the comparatively long distances they will be used for Class 700s are high capacity units. Want to know where the crush is less (if it is less), well the PIS can advise you. 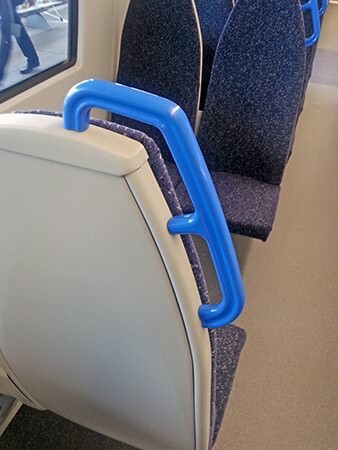 (below right) the pattern of seat back grab handles. 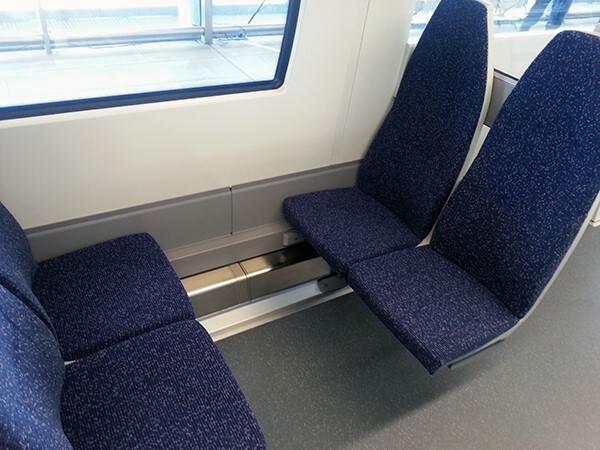 It has already been observed that use of the grab seat side (almost vertical) option will force standees more out into the aisle, potentially reducing standing capacity (but less invading the personal space of the person who is lucky to have the seat! ).